Critical levels of ozone (O3) and sulfur dioxide (SO2) for protecting European forests are not evaluated to apply to East Asian vegetation. Based on the results obtained from the long-term experimental studies on the effects of chronic exposure to O3 or SO2 on 30 young potted grown tree species using open-top chambers, we analyzed dose-response relationships between the whole-plant dry mass increment during the experiment and concentration of air pollutants to establish Asian critical levels. While the annual mean concentration of SO2 corresponding to a 10% reduction in the whole-plant dry mass increment for the most sensitive tree species was estimated to be 5–15 nl l−1 (ppb), it was over 30 ppb for the less sensitive tree species. The AOT40 of O3 corresponding to a 10% growth reduction for the sensitive tree species was estimated to be 8–15 ppm-h for a growing season (6 months) and over 31 ppm-h for the less sensitive species. Critical level of N load for a sensitive Japanese evergreen broad-leaved tree species was considered to be about 50 kg N ha−1 y−1. Furthermore, model estimation suggested that N load in a part of southern China have already exceeded this value. 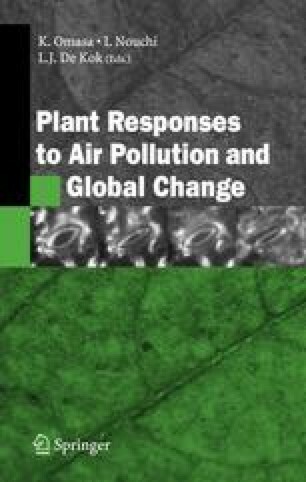 These critical values were estimated by the results obtained from limited experimental studies on the effects of air pollutants or N load on the growth of tree species native to relatively cool temperate zone. Therefore, information about sensitivity of plants grown in tropical to semiarid zones should be accumulated to cover East Asian vegetation.